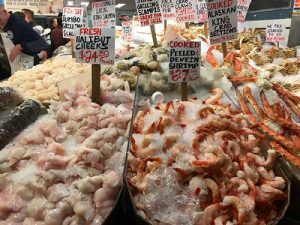 A visit to Seattle, aka The Emerald City, isn’t complete without wandering through the foodie friendly Pike Place Market. You’ll find some excellent eateries here and highly entertaining vendors. In fact, the market’s prime attraction is the wader-clad fisherman in front of a mountain of fish laden ice, tossing his fish rapidly across the counter. The flying fish is deftly caught in a paper wrapper by the guy behind the counter. The Seattle Mariners’ catcher would be proud! But there’s so much more to the Pike Place Market than the tourist shows. The very heart and soul of Seattle, this 111-year-old marketplace attracts hordes of locals and tourists alike, drawn to its artisan cheeses, Russian pastries, fresh Italian deli meats, and other superb food and dining attractions. A nine-acre, multi-story labyrinth of owner-operated shops, this foodie paradise is stacked with full service restaurants, food stalls, delis, and stands overflowing with fresh produce and locally caught seafood. It’s a food lover’s mecca! Every time we visit Seattle, we head to Pike Place and wander the aisles taking in its sights, sounds, and smells. We watch the bakers make their products from scratch and smelling the roasting meats and watching the flying fish. Hungry for lunch when we checked into our hotel last time, we asked Danny, our bellman, where he likes to eat. “I eat at Jack’s almost every day,” he told us. That was good enough for us! 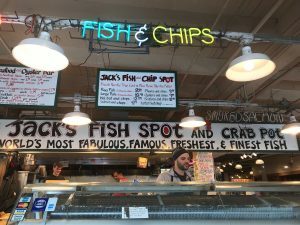 Located in the “Post Alley” section of the market place, the “world famous” Jack’s Fish Spot sells fresh seafood to take home, or you can order sizzling plates of fried fish, prawns, oysters, scallops, and French fries, to eat there. Danny was right. Jack’s fish and chips were lip smacking good! Over the next few days we found ourselves drawn back to Pike Place, discovering new places, visiting our old favorites and doing our best to gain five pounds. For your enjoyment, here is our Pike Place Market food lover’s guide – our favorite places, of course! Pike Place Chowder, super popular with locals, the lunch line snakes out the door. But the wait is well worth it. Their signature dish is piping hot chowder with a fresh sourdough roll. Their chowder list is formidable. You can choose from traditional New England, Manhattan style, smoked salmon, seared scallop, lime and coconut, chef’s choice, or the crab, oyster and chorizo chowder. Almost classy (their words, not ours), since 1957 Lowell’s has been one of Seattle’s secret bars and restaurants. 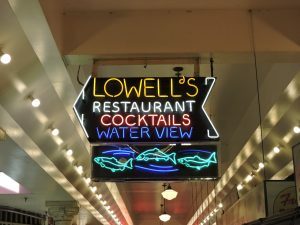 We love Lowell’s for its lively atmosphere, dramatic views of Elliot Bay, and of course, its tasty food. The day we dropped in for breakfast, energetic 50’s rock and roll music, saxophone blasting, was playing in the background. Pam ordered Lowell’s Incredible Tacos made with scrambled eggs, cotijo cheese, green onions, guacamole, and salsa. Gary ordered the healthier Hothouse Garden Omelet loaded with sautéed mushrooms, onions, zucchini, and spinach, topped with a sprinkle of cotijo cheese. Both entrees came with the most delicious, crispy hash browns we’ve eaten in a long time. It wouldn’t be breakfast at Lowell’s without ordering a breakfast drink. They’re famous for their Bloody Marys, but Pam opted for the French 75, a delightful combination of sparkling white wine, gin, fresh lemon juice and simple syrup. Gary ordered a hot Irish coffee blended with Jameson Irish whisky. 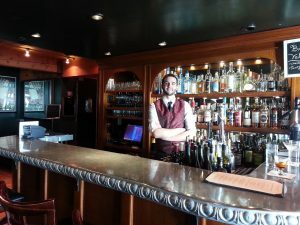 Seattle’s renowned shrine to beer, the Pike Pub and Brewery offers handcrafted brews, upscale pub fare and a unique dining experience in its cavernous, multi-level bar room atmosphere. Gary ordered the kilt mac and cheese, organic penne pasta smothered in local cheeses and blended with Kilt Lifter Scotch Ale, chased with a cold dark Porter. Pam loves their bacon and burgers, and naturally ordered the Bacon Burger made with Woodinville whisky bacon jam, slices of bacon, and ale braised onions. For her, the Naughty Nellie, a golden ale, was the perfect complement to her perfect burger. Another Pike Pub favorite is the Dungeness crab chowder, with potatoes, celery, green and red peppers, cream, and Pike Ale. C’est c’est bon! It’s French cuisine for lunch, brunch, or dinner at Maximilien’s, our favorite eatery in the market. We discovered this delightful French restaurant after returning from a wine themed river cruise through the south of France on the Rhone River. After seven days of sipping wines from France’s famous Beaujolais, Hermitage and Chateauneuf-du-Pape regions, it was such a treat to discover a place where we could enjoy an afternoon glass of Rosḗ from Provence. Even our waitress was French, a transplant from the city of Nice. The views from Maximilien’s are as stunning as those from Lowell’s. The Maximilien bartender made some spirited cocktails on our last visit. Tempted by a well-shaken Vieux Carre, the five-cheese plate (all French, of course) and a seat at the bar with a magnificent window view of the water, we found a lovely way to while away the afternoon. A romantic date night would work well here, too. Beecher’s sells an amazing array of handmade cheeses, but the aroma of grilled cheese sandwiches will draw you in. Crepe de France offers a tasty selection of sweet and savory options. Mounds of delectable confections on display at Rocky Mountain Chocolate Factory make it hard for any chocolate lover to walk past this store. 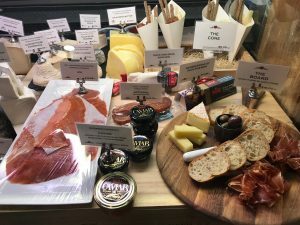 DeLaurenti’s Italian Market sells mouthwatering deli sandwiches, fresh meats, cheese, and breads, and a wide variety of wines to accompany any meal. So fellow foodies, don’t worry about the weight gain. 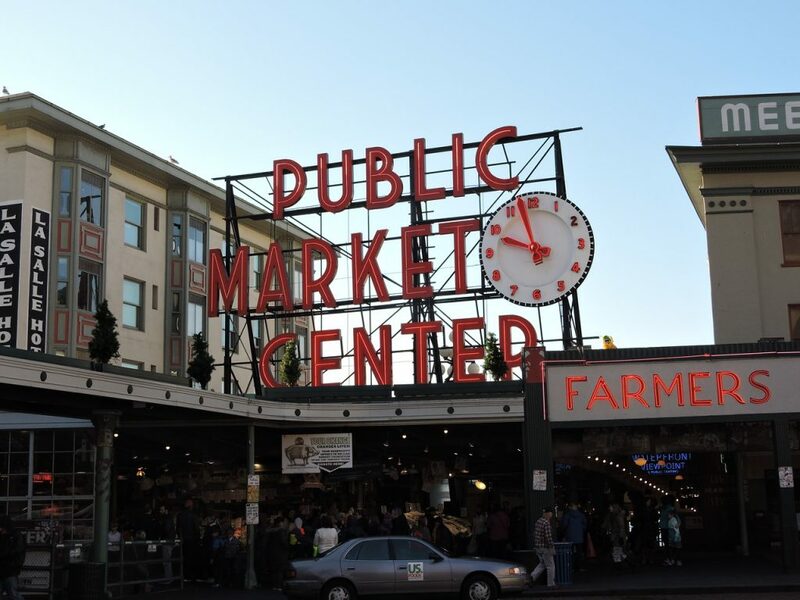 Be sure to allow enough time in Seattle before your next cruise to check out Pike Place Market! Pamela and Gary Baker are freelance writers based in Northern California. 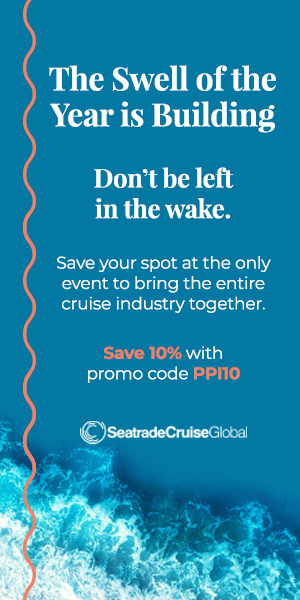 They’ve written for regional, national and international magazines, newspapers and websites including Via Magazine, Destinations, and Australia and New Zealand Magazine.